Who has access to Payroll? Have you ever wondered what access a particular user has within Sage 300 ERP? Have you ever wondered who has access to a specific module such as Payroll? Have you ever been asked by your auditor, controller or IT staff for a list of all Sage 300 ERP users and their permissions levels? If you have, you know that this can be a very time consuming and challenging task. You either need to create this report manually, or print at least 3 different reports within Sage 300 ERP and then try to follow the cryptic trail to determine who has access, and what they have access to. 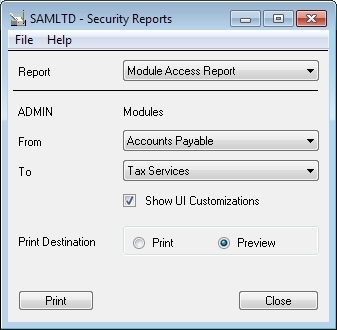 Sage 300 ERP Security Reports provides you with two reports, one by module and one by user, as well as a custom user interface. The module report will allow you to see who has access to a given module or range of modules, and what rights they have within those modules. The user report will show which modules the user has access to, and what rights they have within those modules. 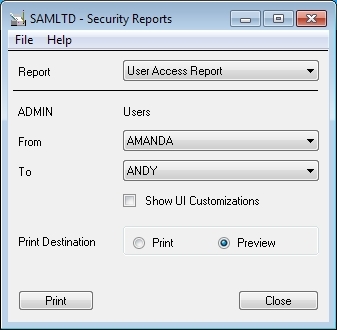 This report will also list any UI customizations (i.e. buttons or fields hidden) assigned to a each Sage 300 ERP user. Both reports combine info from multiple sources into easily readable format. See the examples by clicking on the images below. Why pay for time trying to piece together 3 or more non-user friendly reports when you can get what you are looking for in a clear and concise format?